The star that was baptised Mira in 1662 also gave its name to a watch brand in 1896, a quality brand that introduced a two-way rotor in the 1940’s, the portent of today’s automatic watches. A variable star, Mira is shining brightly again after a long eclipse. 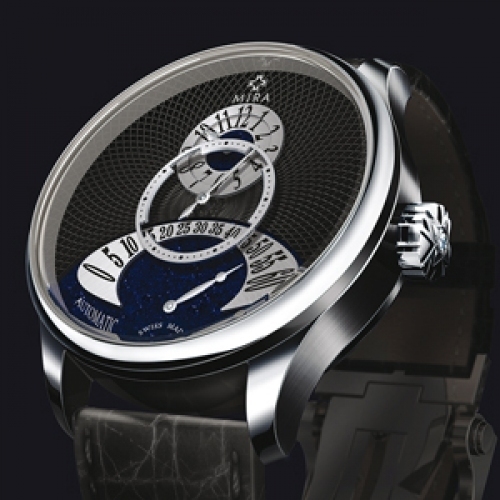 Its renaissance was inspired by the syzygy, the alignment of celestial bodies on the same gravitational axis. A perfect conjunction, Mira’s Space Sensation aligns the retrograde minutes in the lower part of the mother-of-pearl or aventurine dial, a small seconds at its centre and an hour display in the upper part. 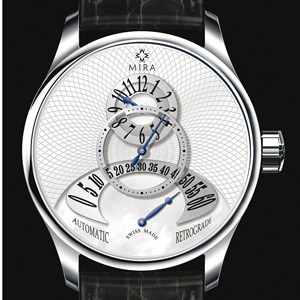 The Mira logo, the 4th celestial body, takes place of honour at the very top of the dial, a dramatic completion of this unique syzygy.